RNAzol® BD is the most effective reagent for isolation of total RNA from whole blood, plasma or serum of human or animal origin. This patented reagent(1) employs an improved single-step method to provide the highest yield and purity of isolated RNA. RNAzol® BD isolates pure and undegraded RNA that is ready for RT-PCR without DNase treatment (2). RNAzol® BD allows for the isolation of RNA and DNA from the same blood sample. The RNA isolation procedure can be completed in 1.5 hours and is performed at room temperature, including centrifugation steps. Typical yields provide 8 – 22 μg total RNA per 1ml of human blood. Due to the removal of impurities, the RNA pellets are smaller and solubilize more easily. 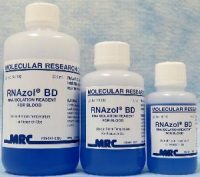 RNAzol® BD is used to isolate RNA from whole blood, plasma or serum. One milliliter is sufficient to process 0.5 ml of whole blood. Chomczynski, P. et al. 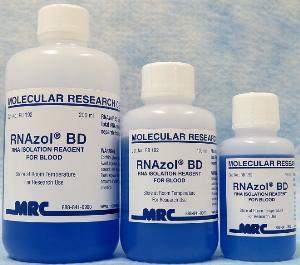 RNAzol® BD: A reagent for the effective isolation of RNA from whole blood. Nature Methods. May, 2013.